The Asian Art Museum is hosting a box building day, where you can build a cardboard world with childhood educator Nancy Gapasin Gnass and local artist Eliza Gregory. The Box Project is a workshop for parents and kids. 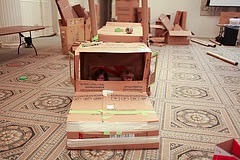 Participants alter and play with cardboard boxes as they would at home, but on an unusually grand scale. Materials include reused cardboard donated by local businesses, which are recycled at the end of the day. Professional parenting educator Nancy curates information about parenting and creativity for participants to take home, and is on hand to answer questions and provide an intellectual framework for the experience. The Box Project celebrates acts of creativity that take place in the home by temporarily placing them in a museum context to catalyze a conversation about creativity, parenting and the gallery space as a creative hub. The project asks: Can we teach creativity? What does that look like? When is parenting itself fundamentally about creativity? How can we become better parents by acknowledging those times? And how can the museum support families in this endeavor? When: Sunday, March 1 from 11-2.